Make that Country Girl Modern. We – meaning more than just me, the Carrie typing this – have known Jo and Kelli for awhile and when she asked us if we’d join the blog hop and review their book, how could we resist? There’s a quilt in the book named “Modalicious”! So here’s the review. The quilts. They’re terrific – a few are such that a quilting-newbie will have great success, and a couple have enough pieces that even a long-time quilt-maven will be kept busy. Some of the quilts need yardage or fat quarters, and others will put a big dent in your scrap basket. This is Bohemian Rhapsody – it’s my favorite and the one that I’m itching to make with something… anything. While it’s made with 1/2 yard cuts, I think this is one that would be great for scrap-busting. The instructions. They’re clear, concise and I love the “Quick Reference Chart” – that’s a genius idea. It’s a “cheat sheet” of how many pieces / units you need to make the quilt. So have I convinced you that this is a great book and you should have one? As your luck would have it, we can help with that last part too. If you leave a comment here by Midnight on Sunday, March 15, you just might win a copy of Country Girl Modern. Be sure to leave your e-mail address with your comment – and no, don’t put the e-mail in the comment, simply include it where and when the comment form asks for it. Thank you to Jo and Kelli for asking us to hop with the Country Girls. And Thanks to YOU for hopping too. I like Bohemean Rhapsody too. Wish me luck. Beautiful quilts! Thank you for the opportunity! I am so happy for Jo and Kelli – wonderful book and beautiful quilts. Beautiful quilts. Love how they tell how many pieces required. I love that Thanks to You quilt! I’ve been following Jo and Kelli for several years now. I’d love to win their book. The first modern quilts I have ever loved. I need this book! I would make all of them. More books should give the finished size of units. Love the quilts and would make several! i’d love to win this book. and you’re right- the cheat sheet is a fantastic idea! I love the cheat sheet. What a great idea. The book looks great, it would be hard to decide what to make first. I would love to win this book. I love the quick reference chart. The book looks fabulous! I love the quick reference. I will add this book to my library. Thanks for the chance to win. All the effort going into the book would be appreciated if I would win. Love the colors. Looks like a breath of fresh air for spring time! Wow! Thanks for a chance to win a copy of this book filled with beautiful quilts. I have never made a “modern” quilt. Just an old fashioned girl, I guess. But the patterns in this book look delicious. I would love to have the book so I could give a new adventure in quilt making a try. Oh I so want to try these quilts. Please my turn to be lucky! Wish all authors would use the Quick Reference Chart in their books! Really love the Star Quilt!! This looks like a great book. The cheat sheet idea is perfect! This Country Girl loves the quilts in this book, so colorful! My favorite is the Star quilt. Great photography too! Thanks for this opportunity. Simply love the quilts previewed, however, I love the “stars” quilt and would love this book. Jo and Kelli are coming to our quilt guild very soon to share their talents. We can’t wait. Their new book looks awesome! Looks like a great book. He cheat sheet idea is great. Especially for people that understand better seeing the visual. Hopefully more authors will use this great idea. Love the star quilt can’t wait to make it. Love the cheat sheet idea. These quilts look amazing and I can add to my “to do list”. Thanks for the opportunity. Oh wow…these are gorgeous. I especially love the last one – Thanks to You. The colors & mix of patterns is outstanding. Thanks for the chance to win a copy of the book. Very nice quilts and I’d like to make one too! Thanks for the chance to win a copy of the book. Lots of interesting quilts in this book – I’d love to win a copy! I love Thanks to YOU! The book looks wonderful! I would love to win a copy. Thanks for showcasing this book, love the way it breaks down the pieces in the quick reference sheet. The pictured designs look like great inspiration to liven up my style too, maybe break me out of my traditional mode. The book looks great: the quilts that you showed us look like such fun and they’re lovely. A quick reference guide is a wonderful idea. Thanks for the chance to win a copy! I’ve been following Jo’s blog for several years, so know the progress of the book. It is beautiful with simple designs. Those look like really fun quilts to make. I’d love the book to dive into – and do some stash diving, too! Looks like an updated take on traditional favorite designs, my favorite approach in quilts right now. I’d love to add this book to my collection. You’re right the instructions look easy! I’m a modern country girl at heart! I follow Jo’s Blog and the quilts in her book are gorgeous. Thanks for a chance to win a copy of the book. Love Jo and Kelli and I love Moda fabrics! I can’t think of a better combination. You had me from the cover! Round bales, IH tractors, rail fences…and quilts? Yes please!! And Thank you!!! Ok so I NEVER thought I would be a modern girl until I attended Quiltcon a few weeks ago. Wow so now I’m diving in and this book would be the perfect way for me to get started. These are modern without all the negative space (which still I cannot wrap my mind around). Thank you for the giveaway…crossing my fingers. I have been making the move from traditional to modern quilting. Love the colors and excitement these quilts bring out of my creative side. This book would be very inspirational. I AM IN MOVE WITH MODILICIOUS!! I love all the quilts that Jo and Kelli have designed , the colors and the designs are wonderful. Yes, I’m in love with Moda & Jo’s Country Junction. I’d especially like to win this book! I really like the Quick Reference Chart! And the bright star quilt is calling my name……another one for the never ending list………. I just started getting interested in quilting books and this one looks like a lot of fun. Thank you! Great book, I would love to win it. Thanks for the chance! The book looks great. I like the page showing clearly how many units to make. When I figure out my own patterns, or make a small quilt bigger, I always do the same for myself. After reading all of the reviews, it’s clear that this book goes to the top of my ‘must have’ list! Love this book. Thanks for the great giveaway. Bohemian Rhapsody also grabs my attention. Another one for my list! Love jo and Kelli’s blog and I’m so excited about their book. Thanks for the chance to win one. I really enjoy making scrappy quilts. This book would be a great addition to my quilt library – 11 Modern-Traditional Quilts from the Junction. Hope I win. Fantastic looking quilts–I love them!!! Thanks for the giveaway! The piece chart is such an amazing idea for new to expert quilters. THanks for a look… into their book! I’m always looking for quilt patterns that will help put a dent in my scrap buckets. It looks like there are some here that would certainly fit that bill! Sounds like a good book to lure in some younger quilters. We need the next generation to get on board! I love the Bohemian Rhapsody quilt, among others in the book and would love to be able to make it. So pick me, please! Carrie – I wait for your blogs and have enjoyed everyone including this pattern book review. I have learned so much. Thank you! the quilts are beautiful, and there are a couple I want to try! I really love Jo’s blog and the new book is great! Thanks for the giveaway! Love these two and their blog! don’t know which quilt I’d start with. Thanks for the opportunity! The Thanks to You quilt is one I’d love to make! Thanks for the opportunity to win! 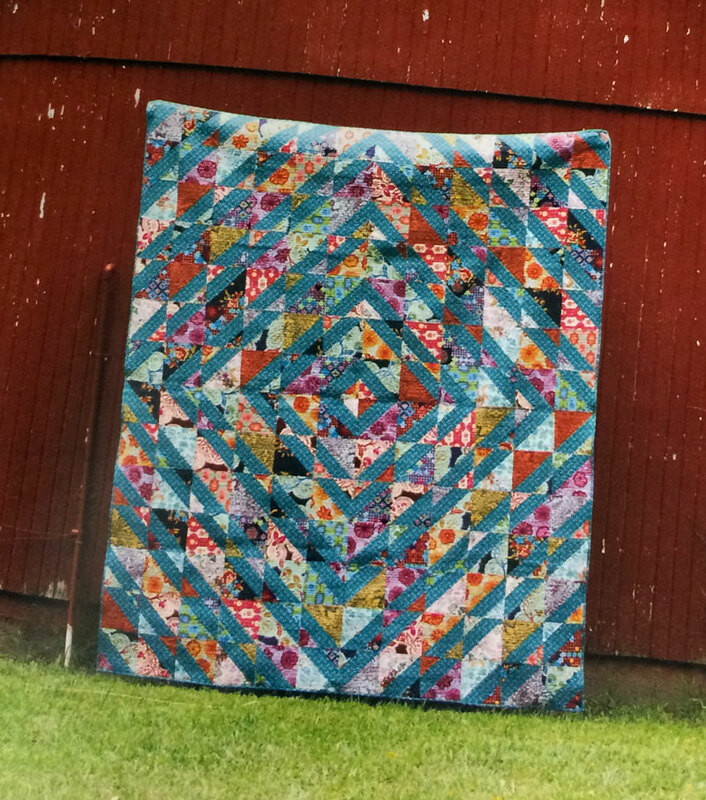 Love that last star quilt pictured in your post! I’d love to win the book. I read Jo’s blog everyday. The more I see of this book the more I want a copy!! Love the Modalicious quilt. Looks likea book i would love to have. Modalicious is one I would like to make. This looks like a totally awesome book! Thanks! Being a visual quilter think the instructions would be great to work from. Love all the quilts you showed! I’m so excited for Jo and Kelli. Their book looks awesome and I like all the quilts, but especially May Flowers. Ongrats to Jo and Kelli, looks like many great quilts. Love you too Moda Bake SHop with that palette builder tab, waht a fantastic tool and handy reference for palette aka: color finding, it works great, thanks! Beautiful quilts – all of them!! Lofe that Moda-licious quilt! Thanks! Thanks for the chance to win, the books looks awesome. I usually don’t like real modern quilts , but these are sew colorful and pretty. I am a Midwestern girl also . Love the book and would really love to win a copy. Thanks for the chance. Beautiful quilts! Looks like the diagrams make quick work of the blocks. All of these quilts are beautiful. I am cutting fabric and almost ready to sew. Love the Thanks to You stars! The book looks great. Love the quilt on the cover thats over the hay bale. Color choice makes all the difference. The quick reference chart looks like it would be great help also. I would love to have a copy of the book. I love every quilt in it. I wouldn’t know which quilt to start first–all the ones shown look so fun. Plus, I’m a sucker for quilt pictures on the farm! Thank you so much for sharing. This book is already on my “need it” list! Sure would be fun to win! Thanks for the opportunity. Great looking quilts love that there are instructions for single blocks. Love the ideas in this book – especially the Quick Reference Chart. Clever! Oh my.. I would love to make one of the quilts too. Love to have the book. I am going to have to find this book. I am trying to get my scraps under control and this book would be perfect. Looks like a great book! I’d love to win it. Thanks for the chance. Bohemian Rhapsody fits this Bohemian Quilter to a T! Me! Me! Me! I’d like to win a copy! Jo and Kelli were really thoughtful about how they wrote this book. Each day of this blog hop I am impressed. I have added this book to my list. Seriously. And the family has been put on alert that my birthday is right around the corner…. I love scrappy and I’m intrigued by the reference chart! That is an inspiring book – I like the chart too! Love the star “you” quilt and the cheat sheet idea. The cheat chart is very clever and helpful. Love the quilts in the book. That “cheat sheet” idea is definitely a good one. Looks like a great book, thanks for sharing! I LOVE when a pattern gives me the total amount of units I need upfront AND the size of the unit!!!. I have worked with patterns where they give me the cutting instructions and show me how to piece the block, but fail to put the unfinished measurement of the block after constructed. I know I can add up the size of the pieces I’m putting together but it’s much more reassuring to get the number upfront. Wins major points for that cheat sheet. In my second year of quilting, Moda is my fabric of choice! Combined with this awesome book, I see fun times in my sewing room! Jo has written a book! How cool is that! It looks great! Thanks. Quick reference chart is what I need with all my patterns, I end up with to many or to few, either way it’s a pain, this would be great, oh and the quilts look super good. You are so right. Great quilts. Thanks for bringing it to our attention. Looks like a fun and inspiring book. And it looks like my list of wanna-make quilts just got longer! Looks like a terrific book to add to my library. Thanks for telling us all about it. Thanks to You is also a favorite of mine in her book. Waiting to see if I win one before purchasing one though, LOL. I think I would really love this book. I don’t need it in the way I need air or food, but still, it looks like a really great book. Thank you for your wonderful blog which I so enjoy. It is almost as good as chocolate! Agree that the Quck Reference Chart would be useful for other quilt patterns/books. it would be wonderful to win a copy of this book – looks like there is a lot there to keep me busy for a while. I like the Quick Reference Chart that you are showing today. Sure hope I win this book! This looks like a wonderful book that I would love to have. I would love to win this book, as there are many quilts I would love to make. Carrie, I so enjoy all the postings by you. Thank you for sharing. I am liking the Quick Reference Chart too. Stash busters are a necessary evil……I hope I win. I too think that “cheat sheet” is a fabulous idea! Finally, a place to quickly see what it is I need to make. And I’ve seen some pics of the quilts in various places–like, like, like! Been following Jo’s Country Junction blog for some time now, and just love what they do. Their recipes always sound yummy too! Love the traditional/ country meets modern. All the cover quilts are beauties too! The Quick Reference sheet is genius! Love like a terrific book. Love the cheat sheet and wish every pattern had one. This book has a lot of cute projects. I would love to win. Oooooh! some very fun looking quilts! Would LOVE to win a copy of Jo and Kelli’s book! I love their blog, too!! Modalicious! Definitely going to be on the lookout for this book. Already saw a couple of quilts for my to-do list. Oh, yes, I would love to win a copy of Jo’s and Kelli’s book! I follow their blog and love their stories, as I do their quilts. Thanks! Wow! The quilts in this book look beautiful! Thanks for a chance to win — this looks like a great book! I really love the Modalicious quilt! Even a non-pattern-writer such as I can get excited about the Quick Reference Chart. What quilter doesn’t long for more clarity at some point during the process? Thanks for the chance to win this fine book. Thanks for the look at this beautiful new book. I see several that inspire me. I would Love to win the book. Great book! I love that the cheat sheet gives the unfinished size of the pieced blocks. Looks like a lot of fun quilts–thanks for the chance to win! I met Jo and Kelli at a Bonnie Hunter retreat weekend. They are the energizer bunnies when it comes to sewing! This looks like a great book. Thanks for the chance to win. I started following Jo first because of the quilts but fell in love because she has beagles and so do I! I’m so happy and thrilled for them with this book. I have been enjoying the blog hop and the different quilts. I love the “cheat” sheets that tell you what you need. Good job, Jo and Kelli! This is definitely a book that I want to add to my library. Thanks for drawing attention to Bohemian Rhapsody; it is such a busy quilt that I have not really looked at it closely. I have now studied it a bit, and you are right, it would be a great stash buster; I like the steady blue that gives some stability to the overall action in the quilt! I am simply MAD for that Thanks to You! quilt! Love it! I like the block choices and the visual cheat sheet is the only way to go in my opinion. HI, book looks so neat! Thanks to you for sharing some real beauties! Looks like my kind of book! Love to sew scrappy quilts. Thanks for the giveaway! The book looks great – thanks for the chance to win! It looks like a very special book—I love what Jo and Kelli make….thanks for the chance to win….I love, Love Moda fabrics……. The cheat sheet is a great idea! Hope a lot of quilters borrow this idea would be great for the readers! This book looks inspiring in so many ways! I would love to see it first hand. What a fabulous idea for the cheat sheet. So helpful. Seems like this would be a good book to have. Lots of great ideas. And I love the cheat sheet. These gals are from the great state of Iowa, and I am close to them, so have been looking forward to their book! Looks like we will not be disappointed! Looks fun! Thanks for the giveaway. Lovely quilts and fabric! Thanks for the chance to win Jo’s book. I like the looks of the simple directions. Thanks for the chance to win. Love the colors in Bohemian Rhapsody and love the “cheat” sheet. Keeps me from doing my post-it note style notations! The quilts I’m seeing in this book are fantastic! I can’t wait to use some scraps and make them. Of course I would love to win this book – it looks awesome! Thanks for the chance. Fun quilts. Would love the book. Wow love the way she displayed them. Would love to have this book. I can’t wait to get my hands on this book- there are so many quilts I’ve seen from it that I would love to make! Thanks! Quilting book with Thanks to YOU quilt pattern. Need to purchase or win! Thanks, Carrie. Enjoying your posts. Educational and fun. Great photo location. Very inspiring patterns. Sounds like a wonderful mother-daughter-relationship! I would love to win the book! Looks like some great quilts to make in this book and I would love to be in with a chance to win a copy in your Giveaway! I would like to win and use up sraps, especially the Thanks to YOU. I love thanks to You! how sweet!! It looks like a great book and the ‘cheat sheet’ is a great idea! There are several quilts in this book I want to make. The cheat sheet is a fabulous idea! Thank you for the chance to win. I know exactly where they are in Iowa. We pass by their place on the way to my mother-in-laws place in Harper’s Ferry. How awesome would it be to win this. Very pretty projects in the book. Thanks for offering the giveaway! Would love to win this book. Thanks for the review. Love the star quilt. I’ve been looking for something new and bright to make a new king size quilt. This might be it! From the looks of it even I might be able to make one of their quilts – Yippee!! I love the Bohemian Rhapsody too. Thanks for the chance to win this book. Lovin’ the quick reference chart. Great idea. Love what I have seen of this book thus far. And I always like references that make it easier. I can already see a couple of quilts I want to make from this book. Thanks for the chance to win. Modalicious! Such nice patterns in an great book. This looks a great book – I like the Quick Reference Char! I can see some of those quilts in my future! Thanks for the chance to win! What a wonderful book! I would love to win a copy. There are several quilts I would like to make. Thanks for the chance to win a copy. Looks like a great book. And the quilts shown are ones I would make. Thanks. I like the vibrant colours in this book. Would love to try my hand at a few of these. Thanks. What beautiful quilts! I would love to see ALL of them. 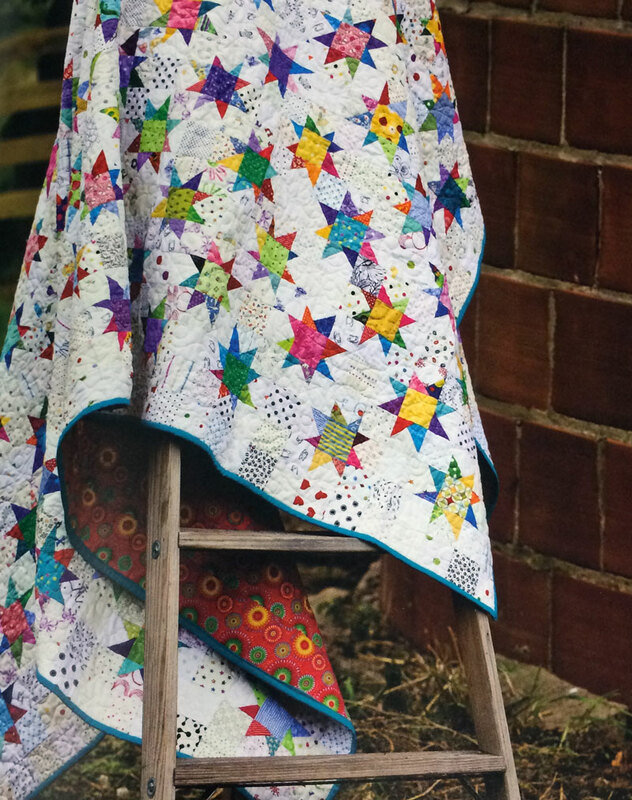 All the quilts in the book look beautiful, love Jo’s blog and Moda fabrics too. Thanks for the chance to win this great book! This is such a great book to have with all those gorgeous quilts to make! That looks like a really great book – love stash busting! What a fun book. Beautiful quilts. Beautiful quilts in this book! I have followed Jo’s blog for a while now and am always inspired by her and Kelli’s work. I love the cheat sheet page, too! Yes, it looks like a great book. I can’t wait to get my hands on a copy. Thanks for the opportunity. Over the years I have developed a similar technique of (yes) actually reading the pattern front to back, and then breaking down just how many of each unit I might need and making a quick drawing and add the sheet to the pattern. Then when I get back to making/finishing the project, I already know what I need and have checked off what is done. I’d love to see her method and learn some new tricks. By the way, I love the star quilt with multiple stash made pieces! I’m loving Modalicious! The rainbow really speaks to me. I love the samples shown!!! I want this book and I don’t even do modern?!! Whoa–I think I could do some serious scrap busting with these beauties! Can’t wait to see all the patterns. I love that reference chart! So very helpful when deciphering a pattern! Thanks for the chance to win this book-the quilts are lovely, it would be hard to figure out which to make first! I’m new to quilting but the quilts you showed are just my style. I’d love to win a book! Bohemian Rhapsody would be a great scrap buster along with most of the quilts in this great book. Thanks for the chance to win one. I love the reference charts! All the quilts look awesome! I really like the quilts shown from the book. Looks like it is a book that would be good to own. This book looks like a must have addition to my small collection! The more I see the quilts in this book the more inspired I feel. If I don’t win one, I’m sure to buy one. This is a beautiful book! Thanks god the chance to win. Beautiful quilts in this book! This book looks very interesting. Would love to win it. I’d love to win a copy of this book. Love the scrappy stars. This looks like a must have book. Beginner or otherwise. Can’t wait to see it! Would love a chance to win a copy. I love the scrappyness of the Thanks to You quilt! Congrats Jo and Kelli on your book…it looks awesome. oh yes! love all the quilts in this book. thanks for the chance. Beautiful quilts! Thanks to You is calling to me. Bright and cheery…love them all! I Love these quilts. I think I would make Modalicious in a heart beat. The star quilt with the red backing is my favorite! I would love to win a copy just so I could tackle that quilt. Thanks for the opportunity to win one! Every time I see another quilt pictured from the book – THAT’S the one I want to make next! Thank you for the chance to win, because apparently I want to make them all! I like all the quilts and would love winning the book. Thanks for the chance to win a copy of Jo and Kelli’s book. Love her book and thanks for a chance to win. It’s been fun hopping around and seeing what other bloggers are saying about Jo and Kelli’s new book!! My favourite is Bohemian Rhapsody too! Looks like a great book full of fun projects. Thanks for the chance to win. I am excited to search your blog. I’ve really been enjoying the blog hop for this book. Great to see so many reviews of it. Thanks for another chance to add this book to my library. Looks like a GREAT book. And I’d love to win a copy. Beautiful Quilts and the instructions are great. Thanks for a chance to win! My first time seeing Country/Modern, I like it! I love them all. But I can’t figure out which one I like most, Modalishish or the star one! What a wonderful book! Thanks so much for a chance to win. I would love to get my teeth em…..Rotary out/in for this book. It looks just the”Bee” knees. Thanks for the opportunity. Learner me Bee. Great looking book, puddle duck appeals to me. Big blocks and lots of color possibilities, what’s not to love! Bohemian Rhapsody caught my eye quickly as well! What beautiful lines! I love Bohemian Rapsody and Thanks to You. I have enough scraps to make a dozen of each. That little star quilt at the end is just twinkling for me to make it. And it definitely a scrap buster. What a great book! Great pictures and instructions. Looks like a winner! Hi Carrie, I like the May Flowers. It is so pretty. Great book and I am an avid fan of their blog and yours too. I love that scrappy star quilt named Thanks to YOU! I would love to win a copy of their book! Thanks for the chance to win! Bright fun quilts. Anything with stars, I am in! Would love to win this book and make Thanks To You, May Flowers….well…you get the idea..I love them all! 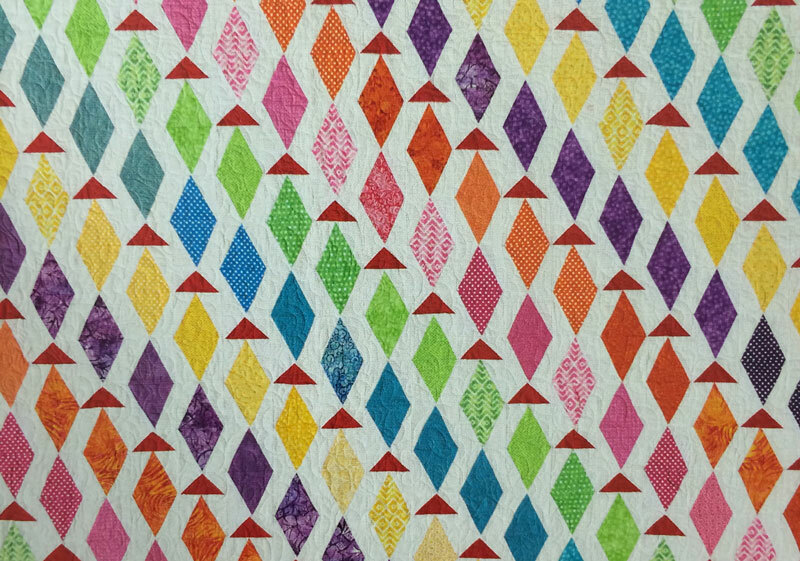 Thanks for the chance…..
I’m loving all of the quilts in this book! Thanks for the giveaway. This looks like a fantastic book! Thanks for the fun giveaway. I aBsolutely love the reference chart. I wish more patterns would use it. What a great opportunity to win that beautiful book. Thank you! This book has several quilts that are calling my name. thanks for the chance to win a copy. The Quick Reference Chart is a brilliant idea! Thanks for sharing. Thanks for sharing! I think this book has some great quilts. I have not purchased a quilt book in a while. But I will be looking for this one. Thanks for the info and the chance to win this book. I enjoy reading Jo’s blog. I would love to read their book! I would love to win a copy of their book, it looks wonderful! I would have a hard time choosing which one to make first. I think this will be a must have book for 2015. I love the way the pattern pieces are shown with the number of sewn pieces needed. I hope I’m the winner of a copy of this book. Thanks for the opportunity. This is definitely a book I want to own. I love the quick reference chart it is definitely a great idea. All the quilts are great, but my favourite is Moda-licious, and I’m not just saying that! I’m always impressed with what Jo and Kelli are busy with – I love their blog, and I’m really excited about their new book! Thanks for a great book review, and thank you for the chance at a fun giveaway! I like May flowers or the scrappy stars but thanks for showing that quick reference chart – I like that. Sometimes I will buy a book because there is a quilt I am itching to make. This book, however, is chuck full of inspiration and there isn’t one quilt I do not like. Jo’s blog is fun to read as you follow along with her life, she is very generous in her sharing. Thank you for the chance to win. Thanks for a chance to win Jo and Kelli ‘s book! That refernce sheet is great! Thanks for the opportunity to win Jo and Kelli’s book. I love the quilts they are so bright and refreshing. Love the rainbow connection quilt. this is a must have book for me. Looks like a book that a newbie like me could tackle! What a great looking book! Thanks for the chance to win! What fun quilts! I love May Flowers. Modalicious is one of my favorite quilts from the photos. It looks tricky but I can’t wait to get a copy of this book and see how to make it! Thanks for the chance to win! I love the “cheat sheet” idea. It gives you the sense that if all you have is a short amount of time, you can still get x done. Thank you for the opportunity to win the book! Bohemian Rhapsody is BEAUTIFUL!!!! The cheat sheet is pure genius, not to mention about time! Great job, ladies! I would love to win your quilt book. I faithfully read your blog daily and feel like I’ve know you forever. Your quilts are beautiful and so is your new Home.. These quilts are fantastic! And, this book would be a great addition to everyone’s home library. Especially mine! Looks like a great book Carrie. Thanks for the giveaway! What a nice book. I love all the patterns. Hopped over to Jo and Kelli’s blog to see all the quilts in the book and I want to make all of them-they are just great! Thanks for the chance to win this wonderful new book! This looks like a great book. I would love to have it! This is one book I am definitely going to have to own. I follow Jo & Kelli’s blog & always enjoy seeing what they are up to. I love this book. They did a great job. There are a few quilts I would love to make from it too! Love their blog and patterns. I would love to win their new book. I agree that the quick reference chart is a great idea. Looks like a great book. I love Bohemian Rhapsody! ohh those are all so pretty!! This looks like an amazing new book that I’d love to add to my library! This book would add a bunch of things to my bucket list, I think! I love the idea of the reference charts. Thanks for the giveaway chance! The more I see of this book, the more I like it. Thank you for introducing it to us! I really do love the designs in this book. Sew appealing! 😉 Thank you for hosting the giveaway! Looks like a great book to add to my library. Although I love traditional quilts, the modern quilts are a fun break. Gorgeous quilts! I’d like to make everyone! Thanks for the fun! Love the scrappy stars with the low column background. Loving the quilts and photography. Would love to make some of these designs. Would love the opportunity to win this book! What a great idea….using scraps!! Scraps seem to multiply when you’re busy with projects. Thanks for a chance in the giveaway. The book looks wonderful and would be a fun addition to my quilting library. Thanks for the chance to win! Tracy D.
I would love to have this book. I want to make the Thanks to You with the stars, and every other quilt too. Thank You for the opportunity to win Country Girl Modern. I love the quick reference chart! Would love to win a copy of this book by Jo&Kelli! It looks great!! It’s always fun to see new quilt patterns. I agree that Bohemian Rhapsody looks scrumptious. I love these quilts. Thanks for the chance to win. The Bohemian Rhapsody quilt is lovely! The totallly yummy Thanks to You is the quilt I want to make. Looks like a fantastic book. Thanks to You for the opportunity, as its my favorite! I’ve been a blog reader of Jo’s for quite some time. I would love to win this book! I love Bohemian Rhapsody. I’m making something similar but would love to try this version. They do a wonderful job with their quilts! Beautiful quilts by Jo and Kelli! Thanks for the giveaway! Kudo’s to Jo and Kelli for a GREAT book! I’m not sure how these two busy ladies were able to put together such a fantastic book but I’m glad they did! 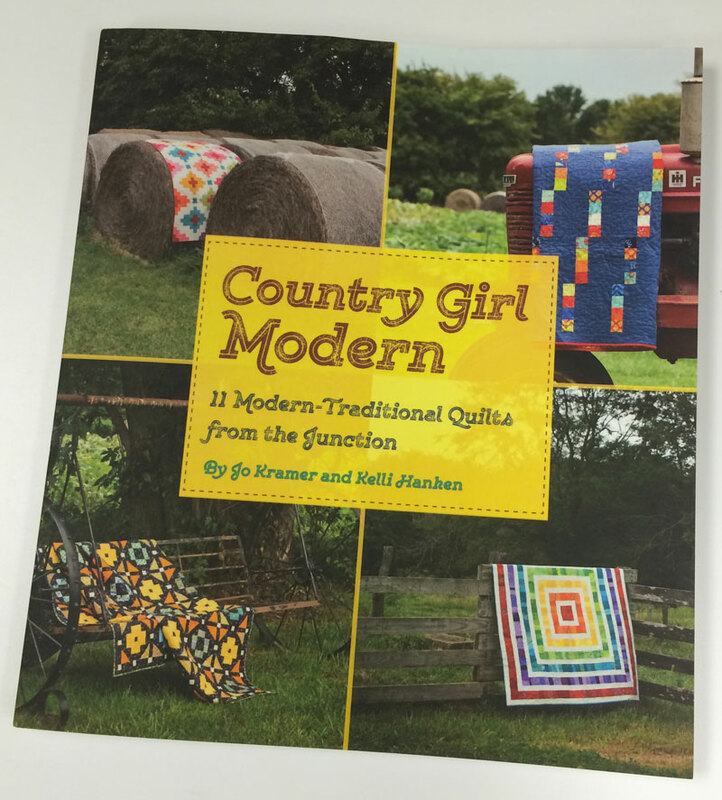 Country Girl Modern is a great book with such a wide variety of quilts. Thanks for the chance. Love everything you showed. On my list to buy! Ohhh, this book looks to be great! I love the few pictures (stingy!) you showed. Hope I win! Looks like a wonderful book , filled with lovely patterns!! Looks like a great book to have around. Would LOVE to win a copy. I agree with you about Bohemian Rhapsody. That would be fun to make! Thanks for a chance. Looks like a winner for sure so count me in. That chart is a great idea. The quilts are beautiful. Thanks for the giveaway. What a great book, and it would be fabulous to win! Very proud that it’s designers are from Iowa! Beautiful quilts, would love to have the book. Thanks for the chance! I am so excited about this new book! I often think of Jo and Kellie as the queens of scrap quilts! This has been such a fun blog hop! I’m loving so many of the quilts in this book and I can’t wait to get a copy! I’ve followed Jo and Kelli’s blog for a while and it’s fun to see they have written a book. I love all the quilts but especially ‘Thanks to You,’ a great name for a quilt! 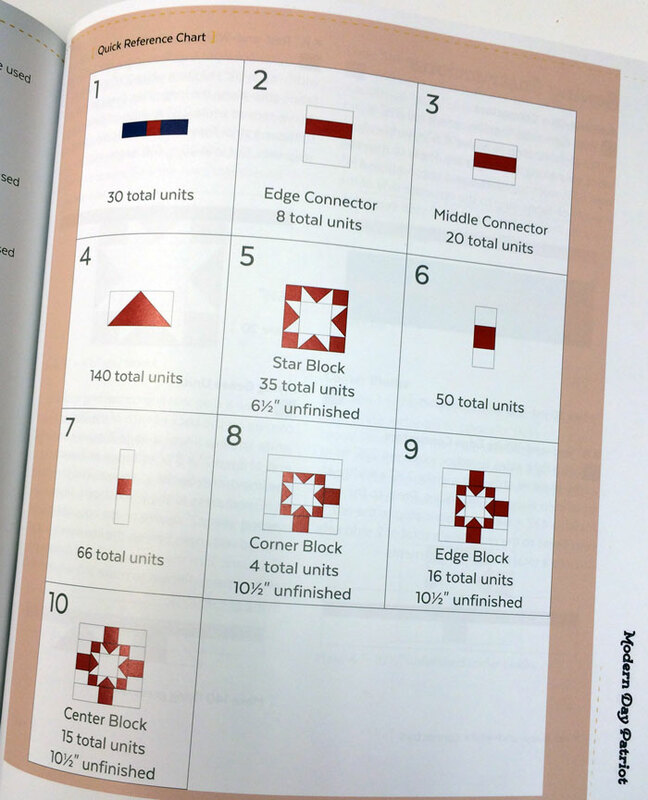 Thanks for showing a picture of the quick reference chart, that sold the book for me. This book looks brilliant, thanks for the chance to win a copy. The Thanks to You quilt is one of the first ones I want to make! Thanks for the great review–This book looks like a lot of fun—and projects look achievable—Love the photos!! Well, I’m hoping the deadline for comments is tonight midnight and not last night! If I’m not too late, I’d love to win. and Bohemian Rhapsody is my favorite. I would love to cradle this book in my hands – one way or another! This book is amazing and the Bohemian Rhapsody would help with my stash.